Politicians love to talk about small businesses. In 2012, former President Obama said, “Small businesses create 2 out of every 3 jobs in this economy, so our recovery depends on them.” There is no doubt that small businesses are an important driver of the economy, so this week I want to take a look at small business sentiment and how politics is influencing it. The National Federation of Independent Businesses (NFIB) maintains a small business optimism index that measures answers to survey questions from small business owners. The questions relate to: plans to increase employment, plans to make capital outlays, plans to increase inventories, if they expect economy to improve, if they expect higher real sales, current inventory, current job openings, expected credit conditions, whether now is a good time to expand and earnings trends. All of these factors make up the index which can be seen in figure 1. 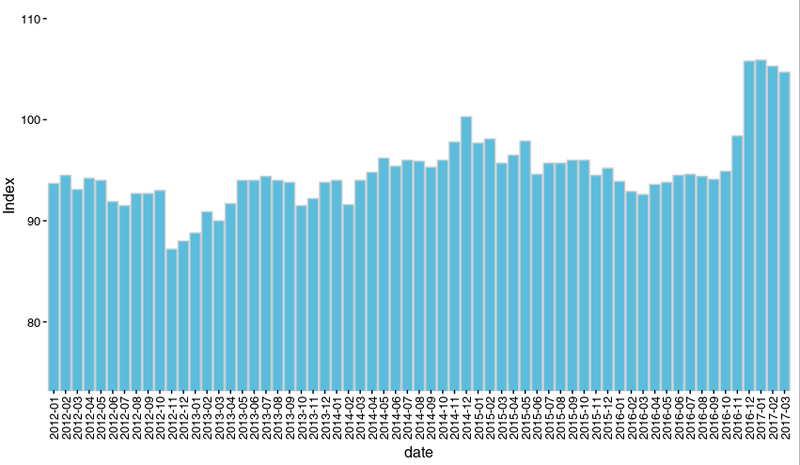 As you can see, there was an enormous surge immediately following the presidential election. Small business owners are clearly excited about Trump’s campaign promises. The NFIB attributes the rise to expectations of lower business taxes, cuts to regulation and a repeal of Obamacare. It should also be noted that the NFIB has conservative leanings which could color their judgment. The NFIB routinely lobbies in Washington for lower regulations and taxes for small businesses. However, their conclusions seem to align with the data collected. The small business optimism index is considered “soft data” which separates it from “hard data” like GDP. Additionally, the index is seen as a leading indicator, meaning that it will theoretically be indicative of future economic data. Prices in the stock market are also viewed as a leading indicator and have increased alongside the small business optimism index. However, the optimism expressed since the election has not been playing out in the real data yet. The Atlanta federal reserve bank is currently forecasting GDP at 0.5%, which would indicate another decline in the GDP growth rate sequentially and compared to Q1 2016. Another consideration is that the March survey was taken before Trump’s healthcare plan failed. Healthcare is a major consideration for small businesses and their optimism will likely take a hit in the upcoming survey. In my opinion, the survey is a lot more interesting when you dig into the detailed questions. For example, the survey asks small business owners what the most important problem is. Currently the top 4 most important problems for small businesses according to this survey are: Taxes (20%), Government regulations and red tape (17%), quality of labor (16%) and poor sales (12%). These trends have been interesting to observe over the years. 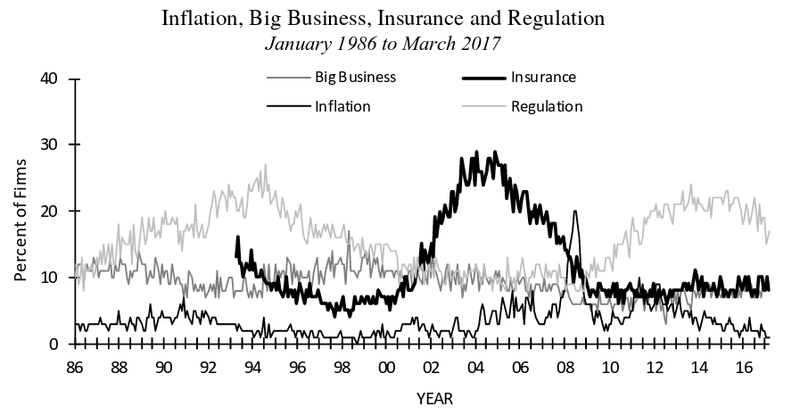 Poor sales were a big problem after 2008 and gradually became less of a problem while regulation has been increasingly cited as a problem since 2008. Labor quality didn’t seem to bother small businesses after the recession, but beginning around 2010 it has been cited as a growing problem that surpassed poor sales in 2014 (See figures 2 and 3). The NFIB small business optimism index is not a major market moving data point, but it can be a useful tool for determining business trends. It will be interesting to see if the enthusiasm following Trump’s election continues or if it fades away as his voters’ excitement subsides. I suspect their will be a significant correction in the coming report and for now it is probably best to take these recent surveys with a grain of salt. However, the longer term trends are instructive and should be considered more carefully. You can read the most recent report here.